An explosion has hit a suburb of Nigeria’s capital of Abuja, near a bus station that was the scene of a bomb attack on April 14 which killed at least 70 people. The blast has claimed at least nineteen lives, according a top official. Nineteen died in the explosion while 60 others were injured, BBC reported, attributing the information to the head of Nigeria's Emergency Management Agency, Abbas Idriss. The blast in the suburb of Nyanya is believed to have been a car bomb. Witnesses told AP a car full of explosives drove close to a checkpoint across the street from the bus station where the April 14 attack occurred. A man reportedly jumped out of the car and ran as it exploded. A security official, who asked to remain anonymous, said two undetonated improvised explosive devices were found at the scene, according to AP. As the recovery unfolds, news outlets have reported varying casualty counts. 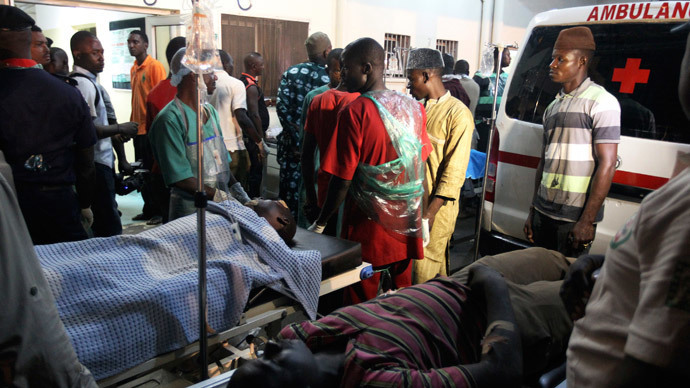 According to Nigeria's Vanguard News, 17 people died in the explosion. The Nigerian Tribune reported that more than 30 died in the attack, with many others injured. AFP reported that at least 16 people died from the blast. The AP said at least 12 have perished, according to Superintendent Frank Mba, spokesman for the national police. A Reuters photographer reported that 11 “charred bodies” at a nearby hospital came from the blast site. "There was an explosion there this evening at about 8:00 pm (1900 GMT)," National Emergency Management Agency spokesman Manzo Ezekiel told AFP. He said it was "not an accident,” adding that rescue officials were at the scene. "There was a loud blast then a ball of fire," witness Lateef Adebayo told Reuters. "There were many dead bodies and ambulances were rushing there." A second witness, Joe Udofia, told Reuters there was a "deafening explosion, then the area near Nyanya bridge was on fire. There were many people in the vicinity." No group has claimed responsibility for the blast. The militant Islamist group Boko Haram, which claimed the April 14 bombing, has attacked Abuja before, though most of their strikes have occurred in northeast Nigeria. Abuja is due to host the World Economic Forum on Africa next week. The event includes international leaders, policymakers, entrepreneurs, and others. The Nigerian government says a hefty security operation is planned for the capital during the forum.